The startGBC Fundamental Workshops have been designed to help learners to understand the basic building blocks of entrepreneurship. From ideation, research, product validation through to pitching the idea to others. Even if you never become an entrepreneur, the learning outcomes of these workshops will help you develop an entrepreneurial mindset. How to think in a more critical and design thinking way. Click here to learn more about the Ideation & Critical Thinking Workshop and register for the next session. 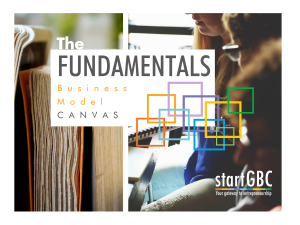 Click here to learn more about the Business Model Canvas Workshop and register for the next session. Click here to learn more about the Product Validation Workshop and register for the next session. Click here to learn more about The Pitch Workshop and register for the next session.